Today's Bloodbath Formula example is a grenade attack at a cinema in Pakistan this weekend. The main driver is the long-lived Pallas-Pluto trine which has brought us numerous such events in recent months. The trine is waning for the moment due to Pallas retrograde: it will be back in the summer and give us two passing semisquares on the way. As always, Pallas is the libertarian non-aggression principle, which is weakened by aspect to Pluto. The other points of the Bloodbath Formula are shorter-term configurations which bring out the potential violence of Pallas-Pluto connections. 5. 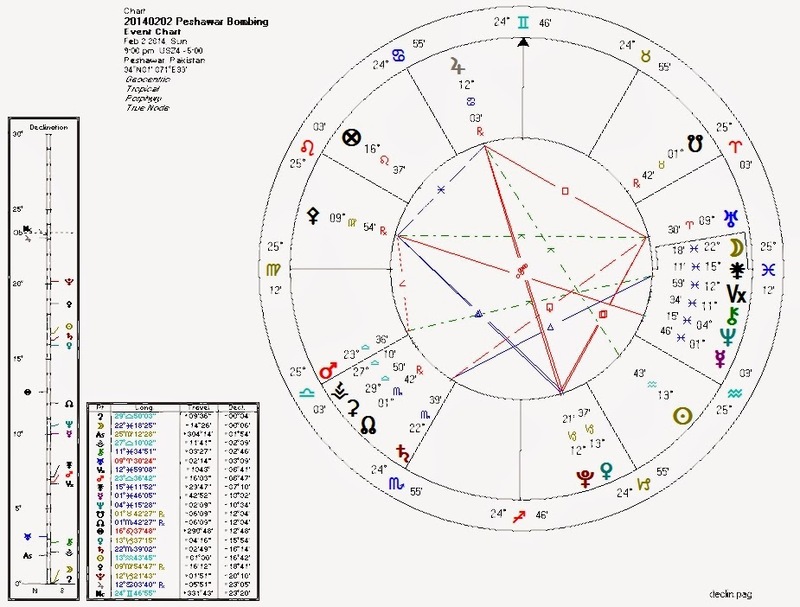 Pluto square Uranus, ruler of the Sun. This blog has basically tracked every mass killing reported on either drudgereport.com or infowars.com since May 2013, and compared the event charts with the Bloodbath Formula. Sadly, there is no shortage of examples that the formula works.